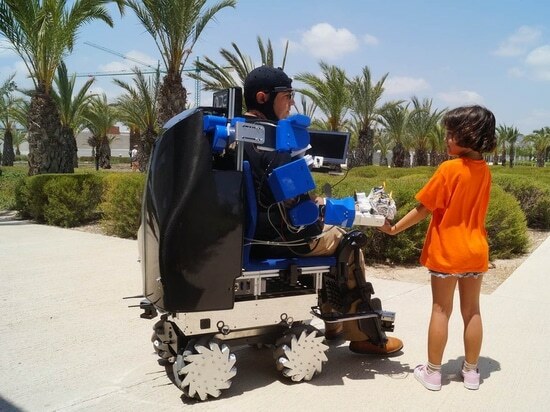 Professor Nicolás García-Aracil from the Universidad Miguel Hernández (UMH) in Elche, Spain, has developed an automated wheelchair with an exoskeleton robotic arm to use at home, as part of a project called AIDE. It uses artificial intelligence to extract relevant information from the user, such as their behaviour, intentions and emotional state, and also analyses its environmental surroundings, he says. The system, which is based on an arm exoskeleton attached to a robotised wheelchair, is designed to help people living with various degrees and forms of disabilities carry out daily functions such as eating, drinking, and washing up, on their own and at home. While the user sits in the wheelchair, they wear the robotised arm to help them grasp objects and bring them close—or as the whole system is connected to the home automation system they can ask the wheelchair to move in a specific direction or go into a particular room. Its mechanical wheels are made to move in narrow spaces, ideal for home-use, and the system can control the environment remotely – for example, switching lights on and off, using the television or making and answering phone calls. What's more, it can anticipate the person's needs. "We can train artificially intelligent algorithms to predict what the user wants to do," said Prof. García-Aracil. "Maybe the user is in the kitchen and wants a drink. The system provides their options (on a monitor) so they can control the exoskeleton to raise the glass and drink." The technology isn't simple. As well as the exoskeleton robotic arm attached to the robotic wheelchair, the chair has a small monitor and uses various sensors, including two cameras to recognise the environment, voice control, eye-tracking glasses to recognise objects, and sensors that capture brain activity, eye movements and signals from muscles. Depending on each person's needs and disabilities, the multiple devices are used accordingly. For example, someone with a severe disability such as a cervical spinal cord injury, who wouldn't otherwise be able to use voice control, could use the brain activity and eye movement sensors combined. The user wears a cap on their head, filled with electrodes, to record the brain's activity which controls the exoskeleton hand's movement, explains Prof. García-Aracil. So when the user sees themself closing their hand onto an object for example, the exoskeleton arm actually does it for them. This technology is called brain-neural-computer interaction (BNCI), where brain—as well as muscle—activity can be recorded and used to interact with an electronic device. But the system can sometimes make mistakes so there is an abort signal, says Prof. García-Aracil. "We use the horizontal movement of the eye, so when you move your eyes to the right you trigger an action, but when you move your eyes to the left you abort that action," he explains. The AIDE prototype was successfully tested last year by 17 people with disabilities including acquired brain injury (ABI), multiple sclerosis (MS), and spinal cord injury (SCI), at the Cedar Foundation in Belfast, Northern Ireland. 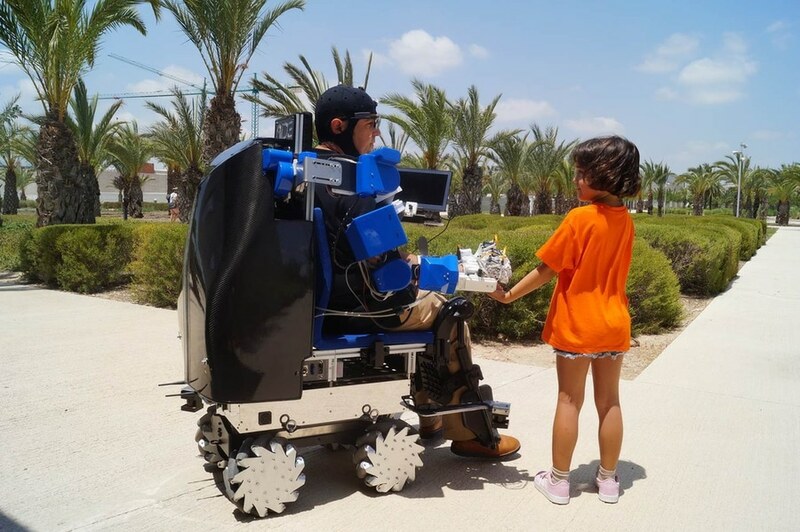 Its use was also demonstrated at UMH in Elche, with the user asking to be taken to the cafeteria, then asking for a drink, and drinking it with the help of the exoskeletal arm. Now more work needs to be carried out to make the system easier to use, cheaper and ready for the market, says Prof. García-Aracil. But it's not just new high-tech wheelchairs that can increase the functionality for users. Researchers on the FreeWheel project are developing a way of adding motorized units to existing wheelchairs to improve their utility in urban areas. "Different settings have different challenges," said project coordinator Ilaria Schiavi at IRIS SRL in Torino, Italy. For example, someone with a wheelchair may struggle to go uphill or downhill without any physical assistance whilst outdoors. But this system could allow people using wheelchairs to have an automated wheelchair experience regardless of whether they are indoors or outdoors, she says. The motorized units would attach to manual wheelchairs people already have in order to help them move around more easily and independently, Schiavi explains. These could either be rented for short periods of time and tailored according to the location—an indoor or outdoor environment—or bought, in which case would be completely personalised to the individual. The researchers are also developing an app for the user which would include services such as ordering a bespoke device to connect the wheelchair and the unit, booking the unit, controlling it, and planning a journey within urban areas for shopping or sightseeing. "You have mobility apps that allow you to book cars, for example. Our app will allow the owner of a wheelchair to firstly subscribe to the service, which would include buying a customised interface to use between their own wheelchair and the motorizing unit they have booked," said Schiavi. "A simple customised interface will allow wheelchair users to motorize their exact device, as it is used by them, at a reasonable cost." Customisation is made possible through additive manufacturing (AM) technologies, she says. AM technologies build 3-D objects by adding materials, such as metal or plastic, layer-by-layer. Schiavi and her colleagues are exploring various uses for the motorized units and next year, the team plans to test this system with mobility-impaired people in both Greece and Italy. They hope that, once developed, they will be made available like city bicycles in public spaces such as tourist attractions or shopping centres.